When governance collapses, the judiciary has to step in. It has been seen time and again that despite the judiciary repeatedly saying it would rather not interfere with governance, it has to step in when the system fails. 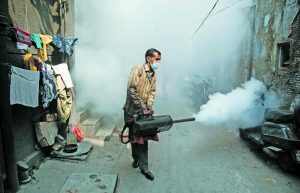 The latest was when the Delhi High Court pulled up the state government, civic bodies and the centre for their unstructured and unregimented programmes to prevent vector-borne diseases from spreading. The Court minced no words, calling the present scenario a “horrible situation” and demanded to know how many houses were inspected. 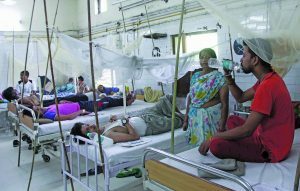 A bench of acting Chief Justice Gita Mittal and Justice Pratibha M Singh wondered why the concerned authorities had not put up any ads on the preventive measures and the treatment for various diseases. The bench said that there needed to be an aggressive campaign like Swachh Bharat and suggested that street plays be organised to create awareness of diseases and how to avoid them. The bench stressed that under Article 19, the Right to Life included the Right to Know. People should be informed about how to stop mosquito breeding and what treatments were available for dengue and chikungunya. When the Delhi government presented research on how to tackle mosquitoes to the Court, the bench rejected it saying that what it wanted was an action-taken report. On May 31, the bench headed by Justice Mittal said that it did not want citizens to suffer just because excuses were being made as to how one department was under the centre and the other under the Municipal Council of Delhi (MCD). Justice Mittal minced no words when she warned that if the court is misled then contempt charges would be filed. She said that it was apparent that the authorities had no concerns and that there was a need for them to sit down and resolve the issue. The government counsel agreed that the MCD did not have a proper solid waste management programme as all waste disposal sites were full. A government report said that garbage, stagnating water, illegal constructions, dengue and chikungunya were all integrated. The bench remarked that the report did not display any scientific planning. The Delhi government also faced flak from the National Green Tribunal which has asked it to fix waste management issues as it was now threatening the health of people around growing landfills. Deputy Chief Minister Manish Sisodia did not respond to queries on what the government plans to do to implement the orders of the courts. For many years now, the capital and many parts of India have reeled under the onslaught of dengue and chikungunya. As summer sizzles before the rainy season, the fears return. Had India been a cleaner country, many of these diseases would not have spread. Despite the high-voltage Swachh Bharat campaign, most of India is pockmarked with garbage, dirt and stagnant water. Mosquitoes thrive in dirty places and cess-pools of sewage which are there in most Indian cities. Though prevention is better and easier than cure, this is lost on the powers-that-be in various states. Take a tour of any district in Uttar Pradesh and the reality of a dirty India comes alive. The Swachh Survekshan survey done by the Ministry of Urban Development which was released recently showed that 41 cities of UP figure at the bottom 100 of the list. Of the 10 worst cities, UP had five. Chief Minister Yogi Adityanath was not amused and called for measures to clean up. Some states have even come up with innovative ideas to stop the breeding of mosquitoes. Gujarat Health Minister Shankar Chaudhary suggested that drones be used to identify if mosquitoes are breeding on terraces. He likened mosquitoes to terrorists who kill people. He said that the state battled with about 40,000 malaria cases last year. The state government then declared malaria as a notified disease, making it mandatory to report cases. It hopes to declare the state malaria-free by 2022. Chaudhary said that every Thursday would now be called “dry day” where people empty and clean their water receptacles. 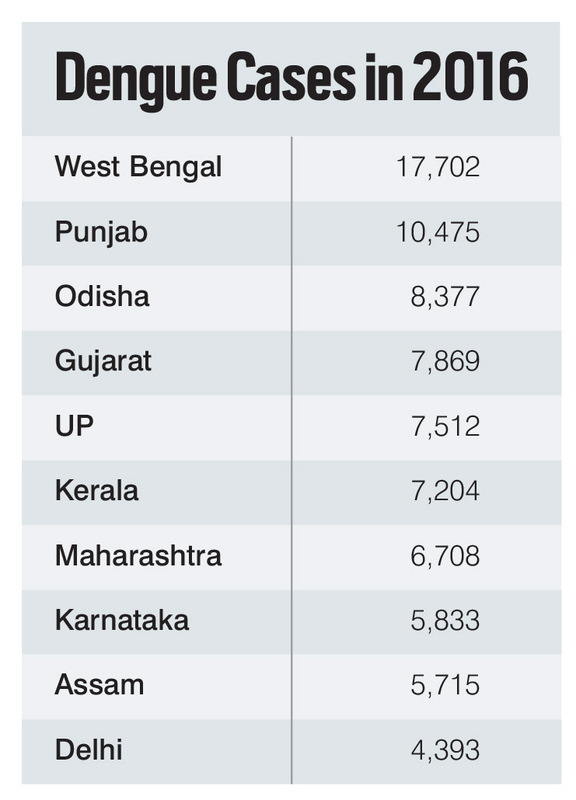 Around 1,650 health workers would be asked to visit 15.30 lakh homes to check for breeding sites. According to the US-based Centers of Disease Control and Prevention, the chikungunya virus too is transmitted through mosquito bites and is spread by Aedes aegypti and Aedes albopictus mosquitoes. Dr Suranjit Chatterjee, Internal Medicine, Apollo Hospital, Delhi, said that the best way to contain chikungunya is to stop mosquitoes from breeding by ensuring that surroundings are clean and free of stagnant water and garbage. But there would be few places in India which wouldn’t fall in this category. India has reasons to worry. According to the Director General of Health Services, last year alone, there were 1,11,880 reported cases of dengue and nearly 15,000 cases of chikungunya. In September 2016, Delhi’s Health Minister Satyendra Jain had accused then Lieutenant Governor Najeeb Jung of “paralysing the city’s health system” as he had transferred the health secretary appointed by the government and then sanctioned leave to the new incumbent when there was a health crisis. By 2050, India will have the largest population in the world, with half of them residing in urban India. 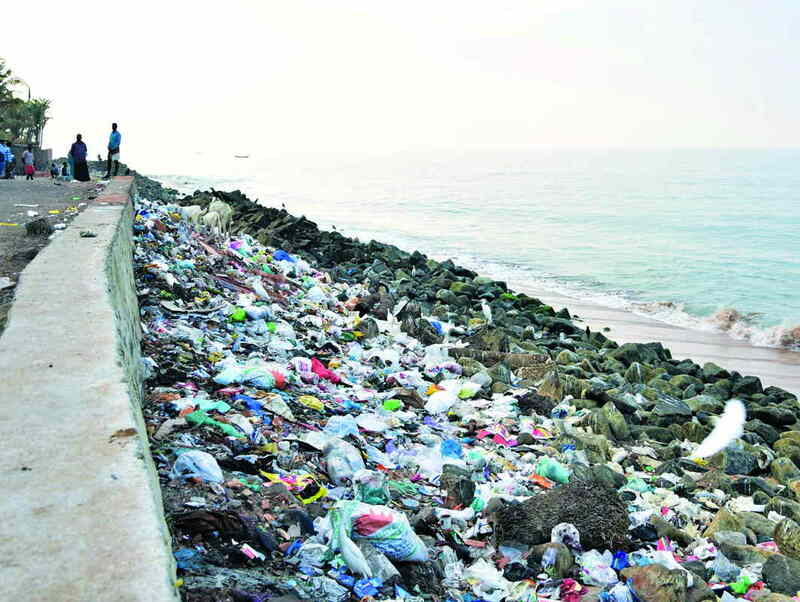 But with cities crumbling, the health crisis will only get worse and be triggered off by mismanagement of solid waste, unauthorised colonies that have no sewage lines and overflowing toxic landfills which will burn or pollute the water table. Some have waste rising to 45 metres. As for Tier II and III cities, there is hardly any concept of waste management. Towns like Gorakhpur, Kanpur, Varanasi and many others are crying for attention. Channels for sewage are often blocked with plastic bags. Many have open drains and breeding places for mosquitoes. Water-borne diseases are common as open defecation continues all over the country. 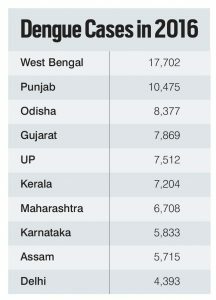 The only states which will be free from open defecation in a few months will be Kerala, Mizoram, Sikkim, Gujarat, Haryana, Uttarakhand and Punjab. Often, children are the worst affected by diarrhoea, Japanese Encephalitis, malaria and typhoid. Nearly 80 percent of the diseases Indian children die of before the age of five are caused by filthy living conditions and contaminated drinking water. As governance is poor and the commitment of government officials leaves much to be desired, we will see more courts cracking down on states to improve the situation.